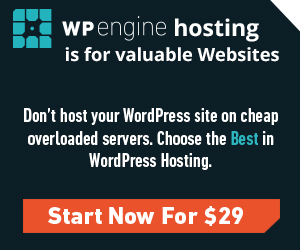 Ellie theme options work through WordPress customizer and are added with the help of Kirki WordPress plugin. It means that if for some reason you choose not to use Kirki on your site, theme options won’t show up. Therefore, it is recommended to use Ellie with Kirki. 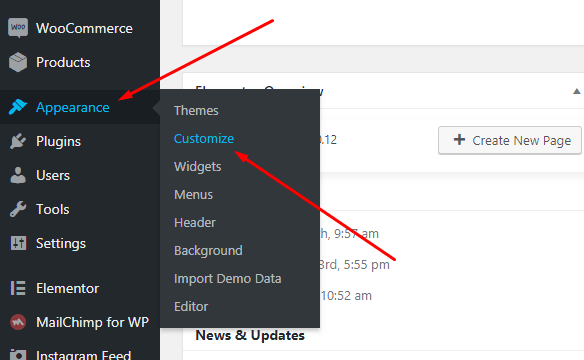 To access theme options you need to log into your WordPress dashboard, then go to Appearance -> Customize. Typography section allows you to change fonts globally across the whole site. Global font, Headings font, Logo Font, Menu Font – you can change all of these things. You have a wide choice of Standard and Google Fonts available to choose from. You can also change font size, color, alignment, variant – pretty much all the things a normal text WYSIWYG text editor can do to your text. This option is not really exceptional, but it’s very important. Because you don’t have to use CSS to influence your fonts. It is very good for those, who do not know CSS or do not want to spend time messing around with the code. Header layout is a powerful set of options which allows you to control the way your header looks. Logo position allows you to define your logo alignment – to the left of the header. Main menu floating – when it’s on the main menu floats around the logo, when it’s off – the logo is displayed above the main menu. Menu items alignment aligns main menu items to the left, to the right, or in the middle of the header. Off-Canvas widget area switcher enables and disables Off-canvas widget area which slides from the left side of the screen. Show shopping cart in header switcher enables and disables shopping cart widget in the header. Sticky Header switcher enables and disables sticking of the header to the top of your browser screen when you scroll down site pages. Please note that sticky header appears on mouse hover and it not visible all the time! This option defines your sidebar position – left, right, or no sidebar, for 3 major groups of your pages: static pages, such as home page, about us page, contacts page etc., blog pages, such as blog arhive and single blog post, and shop pages, such as shop archive and single product page. Show/Hide Footer Sidebar Section switcher defines whether to enable the widgitized are of the footer, where the e-mail signup form is located on our demo site. 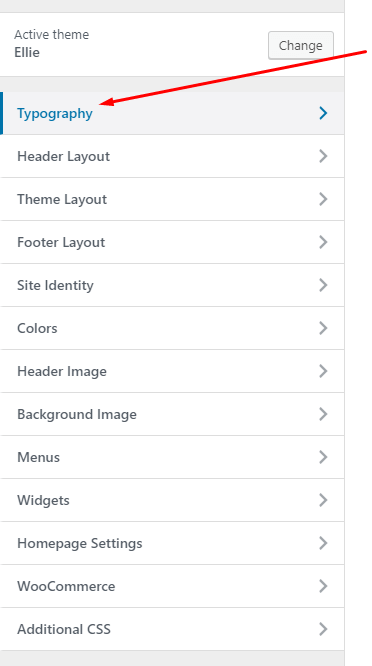 We can see this set of theme options only when you select your blog page in customizer. Blog Posts View helps you to select how you want to display your blog posts, list or grid view. Set the number of posts per row allows you to set the number of posts you want to show per row for posts in grid view. Blog Grid View allows you to select how you want to display your blog posts: in masonry grid, or in simple grid to fit a row. The Blog Navigation Style allows you to select the type of navigation on blog page, paginated or newer/older posts links. Blog Page Banner allows you to set a banner that we can see at the top of the blog page. This set of theme options is visible only when you select your single blog post page in customizer. Post View selector allows you to choose between simple blog post layout with more emphasiss on the image, and modern blog post layout. Ellie clearly stands out among the rest of the free fashion ecoommerce WordPress themes. 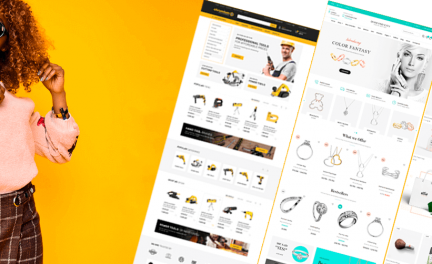 Compatible with WooCommerce plugin, Ellie offers a rich set of theme options you can observe only when you select your shop page in the customizer. Set the number of products per row allows you to set the number of products you want to show per row on a product listing page, from 2 to 5. Set the number of products per page allows you to set the number of products you want to show per page on a product listing page. 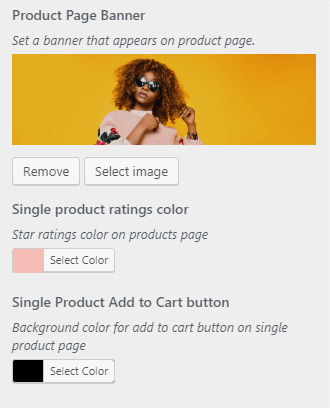 You can see this set of theme options only when you select your single product page in WordPress customizer. 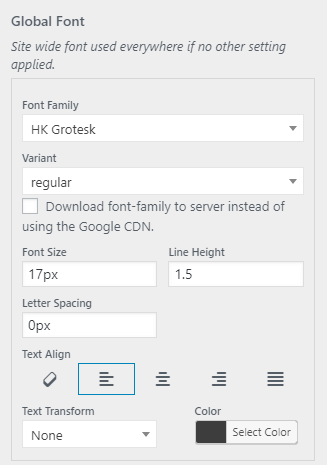 Single Product Price provides you with various font-related settings for product price. Set the number of thumbnail columns on a product page allows you to set the number of thumbnail columns you want to show per row on a single product page. Set the number of related products on product page allows you to set the number of related products you want to show on a single product page. Product Page Banner allows you to set the banner that appears at the top of the product page. Single product ratings color colors star ratings on products page. Single Product Add to Cart button allows to change background color of this button. 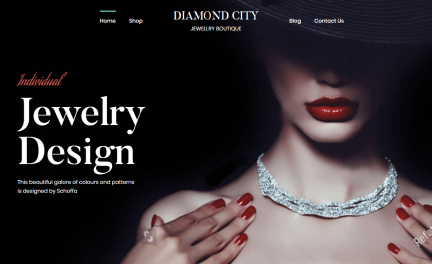 Site identity allows you to change your logo, site title, tagline, site icon. Display Site Title and Tagline checkbox allows you to use a text logo instead of a graphic logo.